One of the most popular posts on my blog is my play tent tutorial. Our tent has been hanging in our basement for nearly two years and it is still one of my kids favorite things. It has been a fort, a cave, a castle, a place to read, a place to rest, and so much more. When I made my tent, it was a bit of an experiment and since I didn't know if it would even work I used very inexpensive white sheets (on sale at Target) to make it. Over the last two years the tent has gotten a little grimy a was in need of a wash. While I had it down (hula hoop removed) I decided it would also be a good time to dye it. I had actually been toying with the idea of dyeing ever since reading this post on Young House Love. To dye slip covers for their dining chairs Sherry and John used a product called iDye. I have used dyes before and have found it to be a messy process with uneven results. iDye can be used in the washing machine (even front loaders like mine) and was pretty much a no mess process. Basically I pre-washed the play tent so that it would be clean and wet before dying. I removed the tent from the washer and poured in the dye mixed with salt and hot water. I threw in the tent and ran the machine on a hot cycle. The Young House Love post has great step by step directions with pictures. 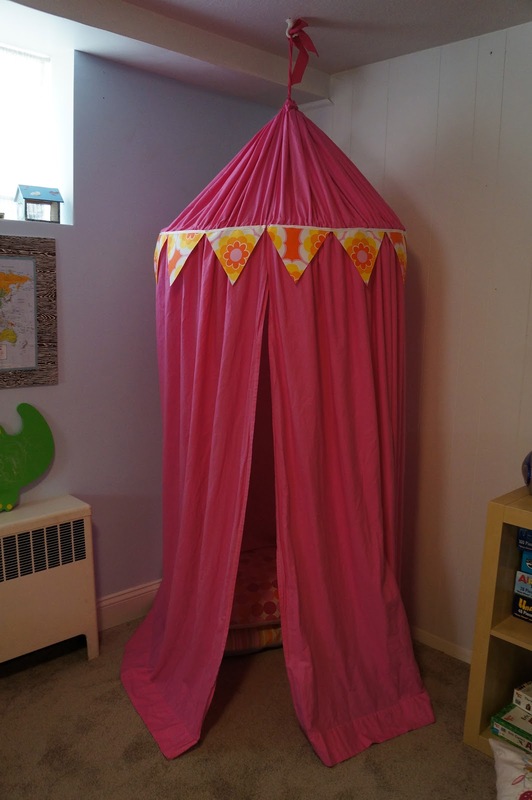 When the cycle was done I pulled out my pink, perfectly dyed tent. I did not remove the string gathering the fabric at the top of the tent and even it was perfectly dyed. I inserted the hula hoop, hung the tent back up, and topped it off with some new new bunting. The kids were very excited to see the "new" tent. The new color makes the tent interior a little bit darker which they seem to really like. I think it makes it feel more cozy. Have you used my tutorial to make your own play tent? I would love to see pictures. Hop on over to my Facebook page to share your creations.